Decorate your powder room in style with our elegant blue and white porcelain tissue dispenser. Hand crafted by master Thai artisans, this porcelain tissue dispenser is beautifully hand painted with stylized bamboo trees and accented with brass trim. Lift the lid to add a stack of boutique size tissues. Measures approximately 7"H x 5" Diameter. PLEASE NOTE: A square boutique tissue box will not fit inside this round container; therefore the tissues must be removed from the tissue box and placed in a stack inside the porcelain tissue dispenser. Decorate your powder room in style with our elegant blue and white porcelain tissue dispenser. 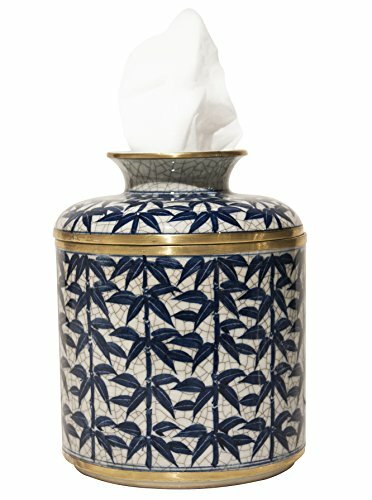 Hand crafted by master Thai artisans, this porcelain tissue dispenser is beautifully hand painted with stylized bamboo trees and accented with brass trim. Lift the lid to add a stack of boutique size tissues. Measures approximately 7"H x 5" Diameter. PLEASE NOTE: A square boutique tissue box will not fit inside this round container; therefore the tissues must be removed from the tissue box and placed in a stack inside the porcelain tissue dispenser.